The Khmer king Yasovarman I was both a conservative and a radical. What congressperson in Washington DC has a big enough imagination to be both? Preah Ko, A Jewel of Khmer Architecture. Yasovarman would outdo him by moving the capital and founding the city that later kings built Angkor Wat and other huge temples in. But before creating something greater than Khmers had ever seen, he paid homage to his father by building a beautiful temple that’s now called Lolei. This dream son respected his family line’s past, then took it to new heights. 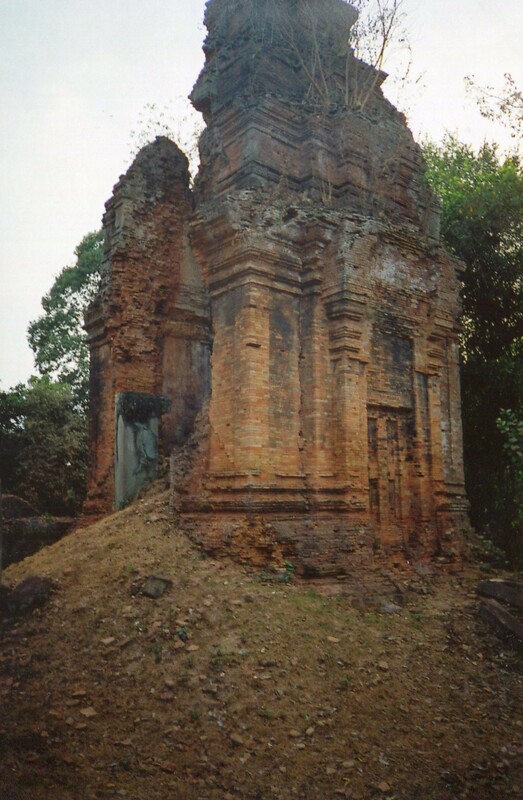 Lolei was an ancestral temple, like Indravarman’s Preah Ko, and it has some of its features. 1.Yasovarman dedicated it in 893 to Shiva–the same god that Preah Ko honored. 2. Lolei has 4 brick towers lined in 2 rows, and they were built on a common platform. Preah Ko has a similar configuration, though it’s more complex. But though Lolei is simpler than Indravarman’s ancestral temple, it has its own beauty. Yasovarman constructed it on an island in the reservoir (baray) that his father dug. This was the first huge baray that the Khmers built, so it stood out all the more then. So Yasovarman built his homage to his ancestors in the middle of one of his father’s greatest constructions. The baray is dry today, but linger there for a few minutes if you go to Cambodia. Its elegant little towers once sparkled like jewels in the limpid water. Yasovarman must have felt satisfied with this tribute to the man who had been the Khmers’ most illustrious builder. He would now move on to construct grander monuments, including Phnom Bakheng.